Royal Plumbing offers a cost-effective hard water treatment solution installed by a professional plumber and guaranteed or your money back! To speak directly with a plumbing professional about nuvoH20, please call our Redding or Anderson offices and a plumber will be happy to assist you and answer any of your questions about our hard water treatment solutions and any other plumbing needs. Say hello to nuvoH2O and goodbye to hard water – forever! If you’ve ever lived with hard water, you know it’s a real problem – clogged plumbing, ruined appliances and those dreaded spots on dishes, fixtures, mirrors and shower doors! Now there’s a solution. 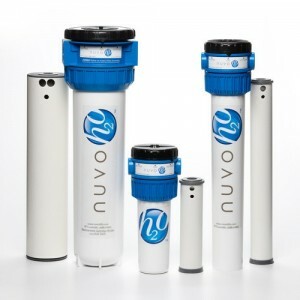 The nuvoH2O Saltless Water Softener System gives you month after month of fresh, clean, soft water for just pennies! It’s simple, safe and easy for your plumber to install. The nuvoH2O cartridge quickly attaches to your water supply and doesn’t require salt, electricity or constant maintenance. The secret is nuvoH2O’s CitraCharge Cell Technology. Powered by food-safe citric acid, the nuvoH2O system breaks the bonds of scale molecules before they can attack your plumbing and appliances. All you’ll notice is month after month of clean, fresh, delicious water – guaranteed or your money back! Just change the patented cartridge. It takes 60 seconds and lasts 6 months. Starting at just 5” x 14”, the nuvoH2O system has a tiny footprint, so you’ll save valuable floor space in your apartment or home. It’s a proven fact – the nuvoH2O System can add up to 30% to the life of your water-based appliances. No more slimy shower water! nuvoH2O doesn’t use salt so you feel fresh and clean after every shower. nuvoH2O doesn’t waste any water, doesn’t require electricity and only contains recycle-friendly components making it healthier for you, your family and the environment.